Red flags. Despite the availability of a large panel of metabolic and genetic tests as well as high-resolution neuroimaging, the cause of disease in the vast majority of patients remains unknown. This situation also applies for intellectual disability, where there is little to offer in terms of diagnostic procedures once patients are negative for array comparative genomic hybridization (array CGH). In clinical practice, we often hope that some minor clinical or biochemical features may lead us to the correct diagnosis, but in the majority of cases, these investigations lead nowhere. Now, in two back-to-back publications in the American Journal of Human Genetics, two papers describe PGAP2 mutations in patients with non-syndromal intellectual disability with elevated alkaline phosphatase. Genetic investigations in intellectual disability. For many cases of intellectual disability (ID) of unknown origin, a genetic basis is assumed. When looking at the percentages of patients explained in some of the landmark studies, you might get the impression that the genetic basis of a large proportion of patients with ID is easily explained. However, the frequencies and percentages reported in pioneer, blockbuster studies are almost always overestimates. In fact, with the available genetic technologies, a causative genetic variant cannot be identified in > 80% of patients. Because of this, clinicians are always on the lookout for additional clues that might help guide the diagnosis towards a specific gene. These might be specific dysmophic features that are characteristic of a particular genetic syndrome or other additional features that help us narrow down the vast range of different causative genes. Intellectual disability is a highly heterogeneous disorder. For example in families with affected boys, probably more than 200 genes on the X chromosome have been described as a cause of X-linked intellectual disability. Again, additional features pointing towards a specific diagnosis are very helpful. Because we have written several times about possible hypotheses regarding the overlap of epileptic encephalopathies and known recessive human diseases including metabolic, storage and neurodegenerative disorders, I thought that I would explain both concepts in this figure. 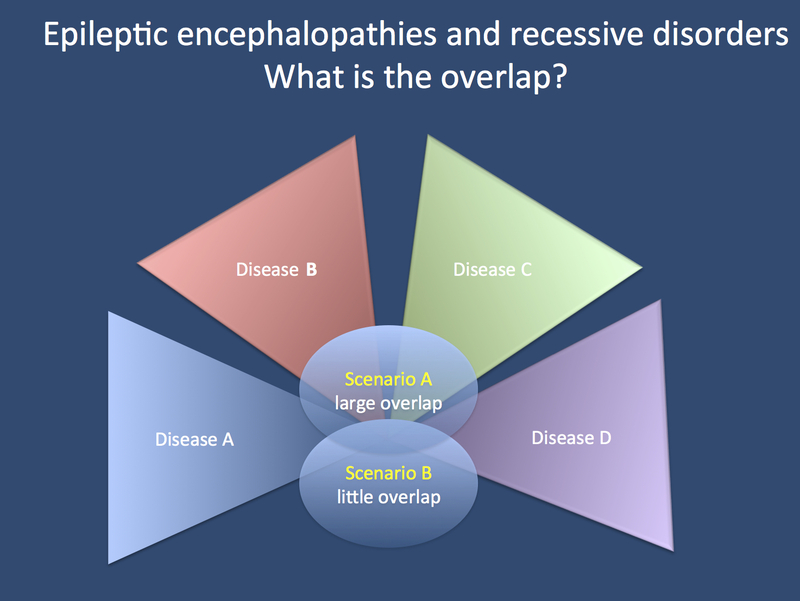 In Scenario A, there is a large overlap of these diseases with the epileptic encephalopathies; in Scenario B, there is little overlap. The shades of the triangles should signify the gradient from typical to atypical presentations. Abnormal lab parameters. Many patients referred for the evaluation for a neurodevelopmental disorders receive a wide range of basic lab tests, most of which virtually always come back normal. However, there are some instances when basic lab tests are repeatedly abnormal and are not explained by medication or acute illnesses. For example, in patients with a mitochondrial disease, an elevated lactate can be seen. We recently also discussed the persistent elevation of creatine kinase in patients with North Sea Myoclonus and mutations in GOSR2. Sometimes, alkaline phosphtase levels can be elevated, a constellation that usually alerts for pancreas or bone disease in patients. However, if an elevated AP is observed in patients without an affection of these organs, this phenomenon is often written off as benign hyperphosphatasia. Now, Hansen and collaborators and Krawitz and colleagues report on PGAP2 mutations in intellectual disability with hyperphosphatasia. PGAP2. While Hansen and collaborators performed exome sequencing in recessive families, Krawitz et al. used a screening of all genes implicated in all known genes encoding proteins in the glycosylphosphatidylinositol (GPI)-anchor-synthesis. Therefore, PGAP2 was identified by two different approaches: a hypothesis-free genomic approach using exome sequencing (Hansen and collaborators) and a candidate gene-based approach investigating a panel of genes within a given pathway (Krawitz and colleagues). GPI anchors are attached to proteins in the endoplasmatic reticulum and assembled to so-called rafts, little islands of GPI-anchored proteins that allow for functional interaction the proteins attached. GPI-anchors are one of the possibilities of the cell to keep proteins attached to the cellular membrane. Particularly in the ER and Golgi, correct building of the GPI-anchors are necessary for posttranslational modification including glycosylation. Accordingly, mutations disrupting genes in this pathway lead to Congenital Disorders of Glycosylation. Hypomorphs. What makes the story of PGAP2 interesting is both the pathomechanism and the existence of hypomorphs presenting with a rather nonspecific phenotype, namely non-syndromic intellectual disability. When a phenotype is less severe than the full-blown presentation, this is referred to as a hypomorph. This term has eventually entered the terminology of human genetics for less severe phenotypes, even though I always find it somehow strange to refer to individuals as hypomorphic. Either way, the presentation of non-syndromic intellectual disability as a mild presentation of a Congenital Disorder of Glycosylation brings up the old debate again whether patients with such a presentation should be systematically screened for underlying metabolic, mitochondrial or storage disorders that might manifest as a mild, non-characteristic phenotype. What percentage of patients with non-syndromic intellectual disability have “hypomorphic” presentations of known genetic disorders remains to be seen. Atypical presentation in epileptic encephalopathies. In patients with severe epilepsies and epileptic encephalopathies, the hypothesis whether patients have an atypical presentation of a known metabolic, mitochondrial or storage disorder is more than an academic endeavor. First, if the probability of identifying these disorders is assumed to be acceptable, diagnostic procedures would need to performed in a timely manner, since some of these diseases are treatable or at least better manageable with a known diagnosis. In addition, the diagnostic work-up usually includes invasive procedures such as lumbar puncture or muscle biopsy. Therefore, establishing the frequency of hypomorphic presentations in epileptic encephalopathies will be one of the results from exome sequencing studies in larger patient samples. This entry was posted in 2013, Epileptic encephalopathy, Familial epilepsies, Publications and tagged autosomal recessive disorders, CDG, Congenital disorders of glycosylation, epileptic encephalopathy, exome sequencing, glycosylphosphatidylinositol, GPI, hypomorph, intellectual disability, PGAP2, X-linked mental retardation. Bookmark the permalink.